Over the past few years, the use of mobile devices for financial activities has expanded from simply checking an account balance to include other types of transactions, such as proximity payments and peer-to-peer (P2P) fund transfers. Millennials have pioneered the adoption of both mobile banking and payments, but adoption is also rising among older adults. 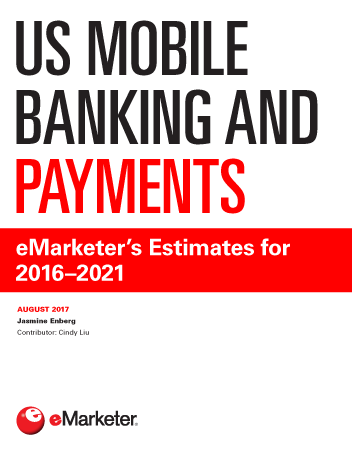 eMarketer projects steady gains for both proximity mobile payment users and transaction value throughout the forecast period. Key drivers of growth include the rising number of smartphone users as well as increased retailer adoption of near field communication (NFC) technology. The number of adult P2P mobile payment users in the US will climb 39.5% in 2017, mainly due to the increasing popularity of Venmo and the launch of Zelle—a service run by 30 US financial institutions that allows free P2P transfers between their customers. Gains will continue through 2021, when more than half (52.1%) of US adult smartphone users will send or receive money through their devices at least once per month. Smartphones are the main contributor to growth in both digital and mobile device banking. eMarketer estimates that the number of adult smartphone banking users in the US will rise by 8.8% in 2017 to 105.1 million, or 69.7% of digital banking users. "In 2017, US consumers will use their phones to pay for nearly $50 billion worth of goods and services at a physical point of sale. This figure will continue to grow by double digits through 2021, when the value of US proximity mobile payment transactions will reach roughly $190 billion."